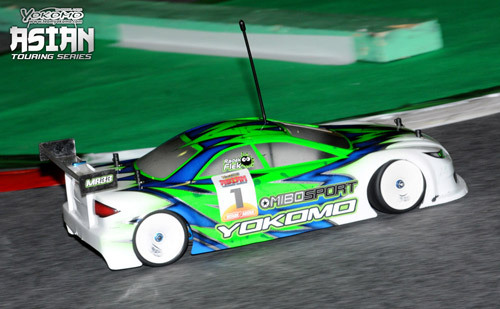 Current Euro Touring Series Champion Ronald Volker has taken the opening round of qualifying for the Asian Touring Series pilot race, the factory Yokomo driver running 19 laps in 5:11.104 to top practice pace setter Juho Levanen by 3 seconds. The German ace described the run as ‘clean’ and said while his LRP powered BD5 WXi was good there was room for some small improvement which he feels if made would allow him to push that little bit harder. Having made mistakes during his practice runs, Volker said his focus for the opening qualifier was to produce an error free run and having seen Levanen, Matsukura and Hagberg all get out of shape ahead of him said he knew the round was his for the taking. Running a fresh set of the hand out Ride 28 tyres, as did team-mate Matsukura, for the opening qualifier, Volker said he should have a better advantage of Levanen and Hagberg who ran used tyres with practice showing his car in particular is better on used tyres. Levanen said his opening qualifying run wasn’t as good as practice when the factory Team Associated driver topped the time sheets. Having changed the timing of his tyre treatment he said it resulted in his TC6, which features all new suspension arms, suffering from understeer in the opening part of the run. This also led to the Finn having to let the number 2 starting car of Matsukura passed which would cost him a little time. Hagberg was on target to run a faster time than Levanen but half way through the 5-minute run flipped him Xray coming onto the main straight. The Swede said his LRP powered T3 2012 was pretty good but he needs to drive it better. The fastest non-European driver with fourth in Q1, Matsukura said he suffered a little from traction roll as a result of changing his tyre preperation. Planning to leave his Nosram powered BD5 WXi the same for the second qualifier, the 18-year-old who set the fastest lap of the round said he will just reduce the timing of his additive for his second qualifier which he said should allow him to challenge the Europeans who he has already shown he is capable of beating on carpet, having won the recent IIC event in Las Vegas. 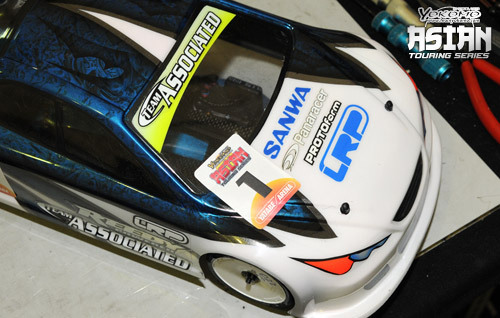 One of the drivers to challenge Matsukura at the recent Japanese Nationals, Akio Sobue took his Tamiya to an impressive 5th fastest time just ahead of Team Xray’s Martin Hudy and France’s Lucas Urbain. Another of Japan’s young Touring Car talents Yuugo Nagashima set the eight fastest time ahead of Yokomo team-mate and 2009 Japanese National Champion Yamauchi Takehiro while Kyosho’s Shin Adachi completetd the Top 10. In Pro Stock Ivan Laptev continued his practice form to top the opening qualifier from Japanese driver Yuta Koike. Laptev said his Awesomatix is working fine but he himself is starting to struggle with Jet lag. One of the last of the European drivers to arrive in Japan for the event due to getting his required travel Visa, the Russian driver said he is struggling to concentrate and this led to a few mistakes in Q1. Also racing the A700 in Modified Laptev, who set the 11th fastest time, said they got the set-up wrong which resulted in the rear tyres over heating but he is confident that reverting to his practice set-up he should be more competitive in Q2. 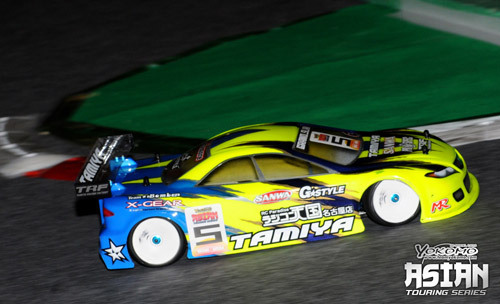 Taking his Hot Bodies to the second fastest time Koike, who is the editor of leading Japanese r/c publication RC Magazine, said his TCX was good but ‘Ivan was too fast’. 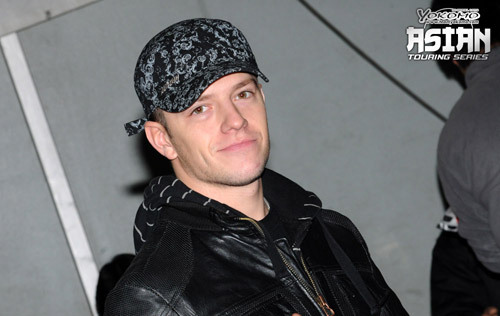 His local track, the Tokyo racer said he will try to run a lower set-up for Q2. 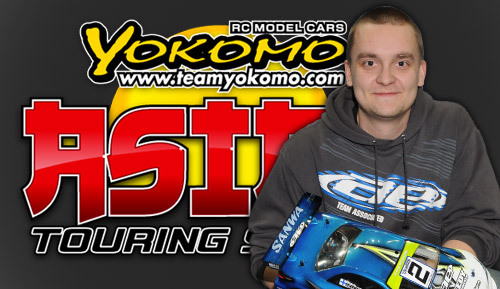 Third fastest, Czech driver Radek Flek said his Yokomo is working really well but said he lost some time when his body tucked after he clipped one of the track markers. 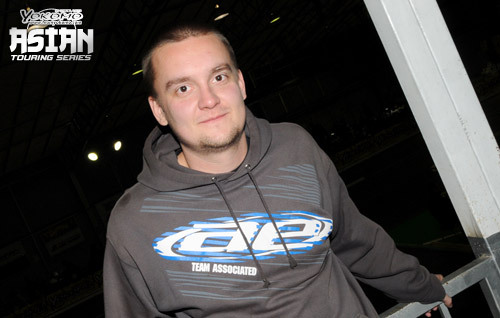 Juho Levanen has topped practice for the Asian Touring Series at the Yatabe Arena, the factory Team Associated driver setting the fastest 3-consecutive laps around the Japanese track in the second of the two controlled practice run this morning. 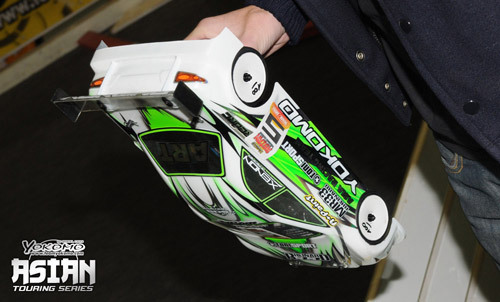 The Finn was just 8/1000th faster than Team Yokomo’s Naoto Matsukura who had topped the opening practice with factory Xray driver Alexander Hagberg completing the Top 3. 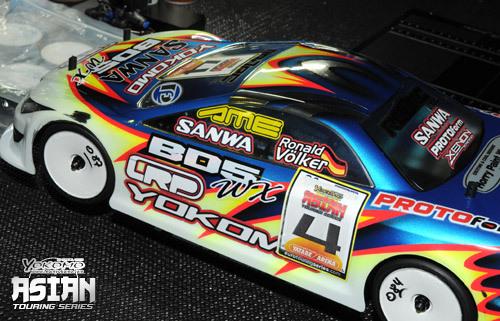 Euro Touring Series Champion Ronald Volker set an identical time to Hagberg but as the Swede ran a faster single lap the German was classified fourth ahead of the Tamiya of Akio Sobue who failed to improve on his CP1 time. Current Japanese Touring Car Champion Naoto Matsukura is the early pace setter at the Asian Touring Series pilot race that is being held this weekend at the world famous Yatabe Arena as part of the grand opening of the recently extended facility that features no less than four indoor tracks. 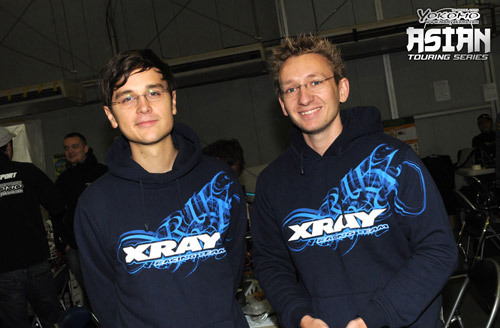 Organised by the same crew that are behind the hugely successful Euro Touring series which kicked off its fifth season two weeks ago in Germany with a record entry, the first ATS event has attracted drivers from 15 countries including a number of Europe’s top drivers and official factory entries from Xray, Yokomo, Kyosho and Awesomatix. 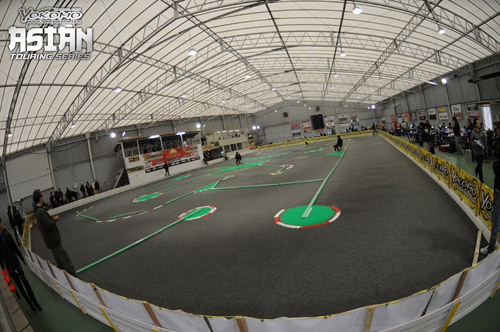 The home track of the back to back 1:12 World Champion, who makes use of the facility almost every day after school, Matsukura said his Yokomo had a little understeer but otherwise it was ‘all good’. 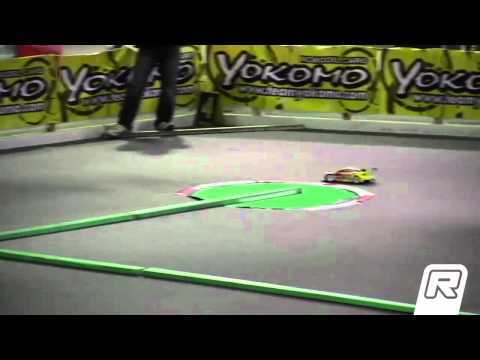 Running on a track layout that was designed for the event by Toni Mateo and Toni Rheinard and laid down Thursday night, the young Japanese ace said the track is different to the faster layouts normally used here but he likes the more technical European feel of the track they have created. 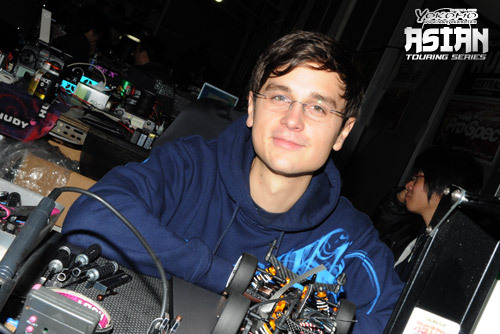 Behind the Japanese ace was Team Associated’s Juho Levanen. The Finn who along with most of the European drivers has enjoyed a number of days testing on the new carpet track which he said was very beneficial as its not normal to get to have as much running back to back alongside on carpet alongside other factory drivers. Running new suspension parts on his TC6, Levanen said they allow for much finer set-up adjustments and in the opening controlled practice the former European Champion looked very good. The 2-time ETS race winner also said the extra stiffness of plastic used has also contributed to what he described as a ‘big step forward’ in the feeling and performance of the car. Third fastest was 17-year-old Japanese talent Akio Sobue. 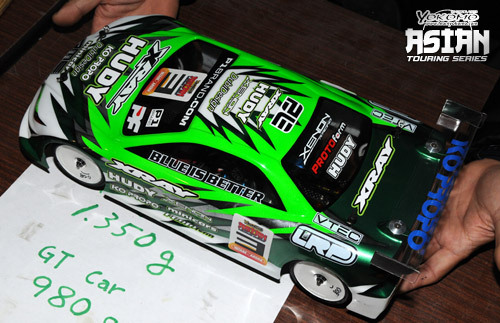 The Tamiya driver who was a finalist at the Japanese Nationals in September, said his car was working well but he will make some small changes for CP2 to try and make the handling a little more aggressive. Making the trip to Japan along with Xray’s designer Martin Hudy, Alexander Hagberg took his T3 2012 to the fourth fastest time based on three consecutive laps. The Swede said the run was ‘OK’ but he needs to make the car more aggressive along with improving his driving. Enjoying the opportunity to get in so much testing prior to the event, which is said is unusual to get at a big race, he added that the track layout put down Thursday night is a lot more to his liking as it is far more technical to that which greeted them on their arrival at Yatabe. Hagberg said one of the big challenges of the weekend is the temperature changes that occur over the day in the large hall that houses the track. Having been very pleasant during the day the temperatures drop considerably in the evening and as today it is raining outside this is the coldest it have been inside the hall during daylight hours. Team-mate Hudy managed only a handful of laps in the first controlled practice after he lost the pin from a front drive shaft in the warm-up but the Slovak driver said up to this everything has felt ‘quite OK’ and he should be able to run a decent time in CP2. Taking a flight route that meant a 24 hour trip from France to Tokyo, Lucas Urbain was looking very upbeat as he set the fifth fastest time. The French ace has struggled this year but thanks to being able to do extensive testing here at Yatabe over the past few days will be looking to end what has been a tough 2011 season on a high note. 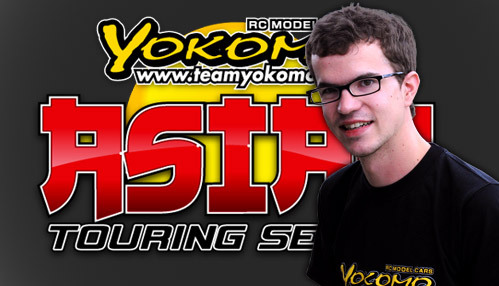 Struggling with his Yokomo being very twitchy and prone to traction roll all season, team-mate Ronald Volker tried the car yesterday and described it as undriveable. The ETS Champion gave Urbain one of his own cars and instantly their was a smile on the French driver’s face as he took to the track. Further testing of the Volker car revealed a problem with Urbain’s radio. Toni Rheinard, who is competing in the Off road event that will run here on Sunday as part of the grand opening but opted to sit out Touring Cars, came to the rescue by loaning him his Sawna M11X for the remainder of the event. Urbain said the Volker car is so easy to drive and he is still getting used to it along with building back up his confidence but he is delighted that he has finally been able to put his problems behind him. Volker managed to set only the 8th fastest time after his run was cut short by a broken double jointed drive shaft but the German ace said everything feels good and he is in good shape for qualifying. Completing the top 6 was Shin Adachi. The Kyosho designer described his TF6 as ‘just OK, not so good, not so bad’. Suffering from a little understeer, the Japanese star said he also needs to make it a little more stable but said he should be in good shape in time for qualifying. In Pro Stock, which differs slighted to that of the ETS with cars running a handout Speed Passion 17.5T rather than 13.5T used in Europe, it was factory Awesomatix driver Ivan Laptev who set the pace ahead of Czech Yokomo driver Radek Flek and Swiss driver Sandro Kuriger who came here running a Tamiya but has switch to a Yokomo after back to back testing the two cars in yesterday’s free practice. In addition to the two regular touring cars classes the ATS pilot race also features the GT500 class which is a Yokomo controlled class that uses an extended 1:12 chassis fitted with very detailed body shells based on the full size Japan GT Championship. After the first controlled practice Atushi Hosoya holds a comfortable advantage over Tadashi Hattori and Isobe Noriyoshi. Drivers have a second controlled practice to get their cars sorted before the first of the five rounds of qualifying of which the best two with determine the grid for Sunday’s finals. The organisers of next weekend’s Asian Touring Series Pilot race at the Yatabe Arena have confirmed more top level entries for this exciting race with the news that former European finalists Lucas Urbain will attend the event. 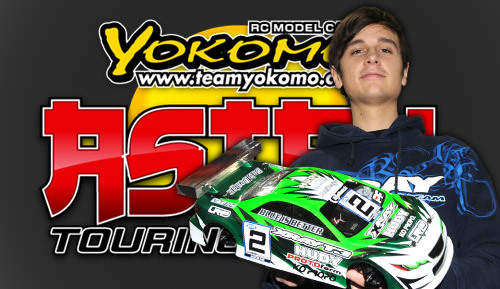 The factory Yokomo racer from France is just one of a number of new European drivers confirmed with Toni Rheinard, Michal Bok, Radek Flek, Ivan Laptev and Sandro Kuriger all going to compete. From Asia there is of course also a lot of interest with multiple World and Japanese National Champion Naoto Matsukura racing alongside former National Champions Daisuke Yoshioka, Takehiro Yamauchi & Shin Adachi as well as Korean National Champions Lee Jung Duk & Eung Chan Kim confirmed to compete. The organisers of next week’s Asian Touring Series Pilot race at the Yatabe Arena in Japan, are delighted to announce that Swedish driver Alexander Hagberg will attend. 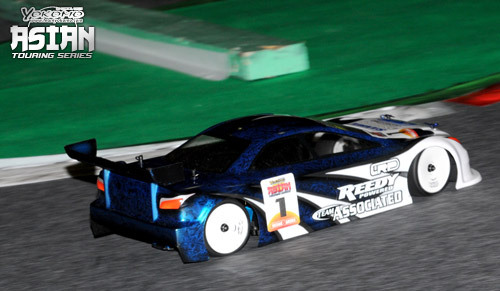 If current form is anything to go by the factory Xray/LRP driver, who will compete at the event alongside the Xray T3’s designer Martin Hudy, is expected to be battling for the race win. The event which will be run from the 18th to the 20th of November will be open to Modified and Pro Stock, running hand out 17.5T Speedpassion motors, as well as a large number of support classes including an offroad race at the Arena’s indoor dirt track. Following on from the announcement that Ronald Volker was set to attend the Asian touring Series Pilot race at the Yatabe Arena in Japan, Finnish star Juho Levanen has also confirmed his entry. 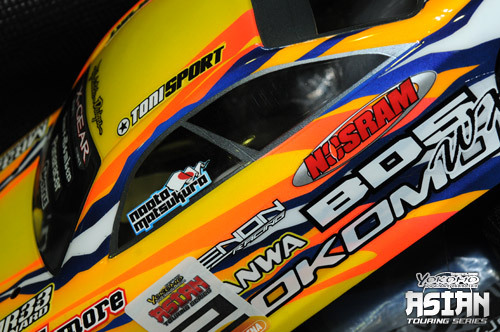 The factory Associated/Reedy driver and former European Champion is the only driver to beat Volker on carpet during last season’s ETS and will be a top contender for the win at the new Yatabe Arena. The event which will be run from the 18th to the 20th of November will be open to Modified and Pro Stock, running hand out 17.5T Speedpassion motors, as well as a large number of support classes including an offroad race at the Arena’s indoor dirt track.